It was great to spend a weekend at home after more than three weeks abroad. I'm back out on the road again this week though, visiting our brand new Melbourne campus (which is looking fantastic by the way) and also attending some meetings in Canberra. The cold mornings in Canberra certainly make me feel proud to call Queensland home. 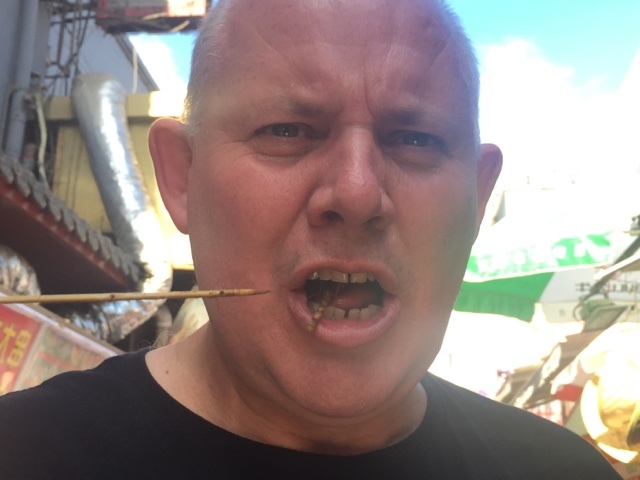 Travelling between meetings I've also been able to reflect on my visit to Asia which included Singapore, Hong Kong, China and Mongolia. It was such a great opportunity for the Chancellor and I to visit leading institutions in those regions and to talk to our counterparts about possible partnerships in the future. 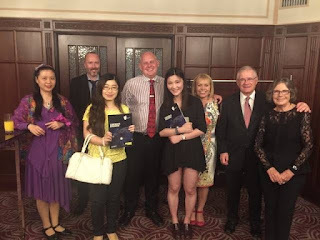 It was also wonderful catching up with our many international alumni and learning more about their time in Australia while studying at CQUniversity and how this experience has changed their lives. There were plenty of highlights throughout the tour and I look forward to being able to go back as a tourist to these destinations soon - especially Mongolia. While not traditionally billed as tourist hot spot I was very taken with the beauty of the country, it's amazing culture and fascinating history. It's definitely a must see for all serious travelers. Below are some of the highlights and pictures from the trip! 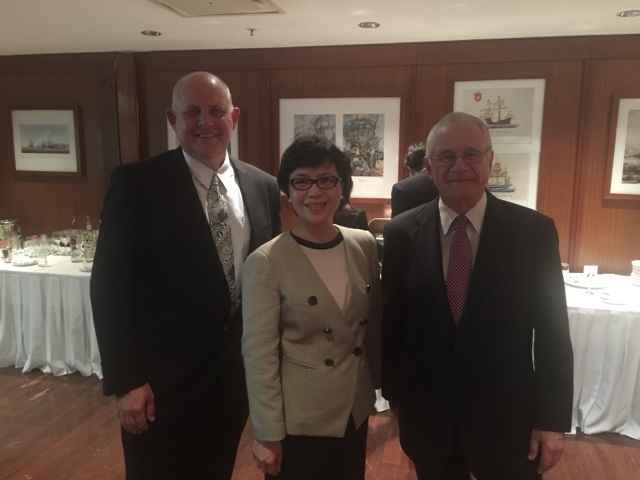 The Australian High Commissioner to Singapore, Phillip Green attended the CQUniversity alumni networking event there. 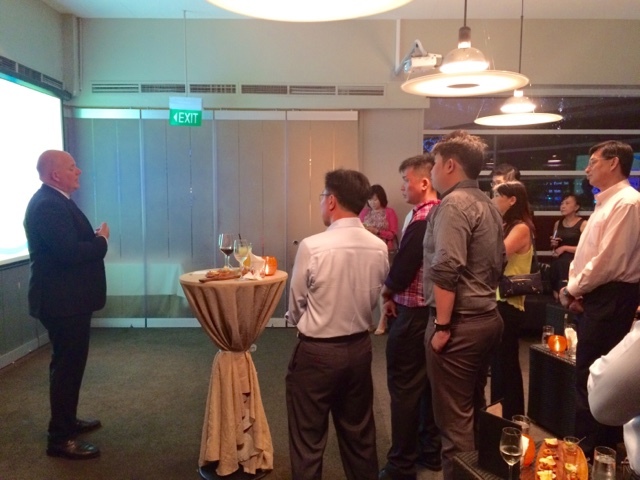 We were very grateful to Dr David Sze and Dr Gavin Chau who came over from Macau for the Hong Kong alumni event. They were from the City University of Macau and are keen to partner with us in the management area. The tour allowed us to meet with some of our most distinguished alumni. 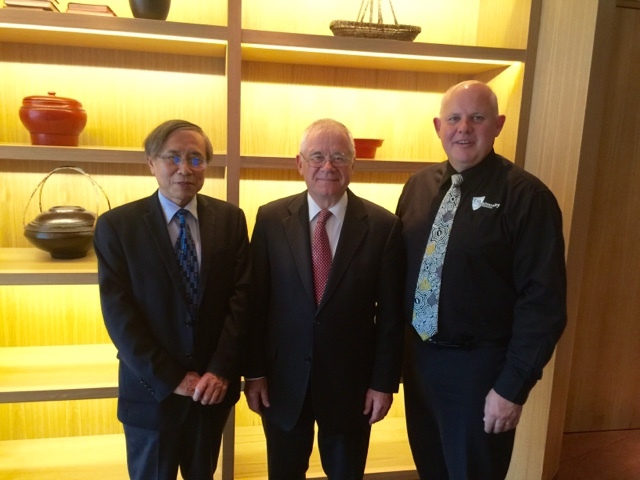 Here the Chancellor and I are pictured with Wai man Woo. He studied at our Melbourne campus and was awarded an MBA. Now he is a very successful businessman and is heavily involved in community services, including being Chairman of the Hong Kong Repertory Theatre Council and an honorary adviser to the Hong Kong Kowloon City Industry and Commerce Association. 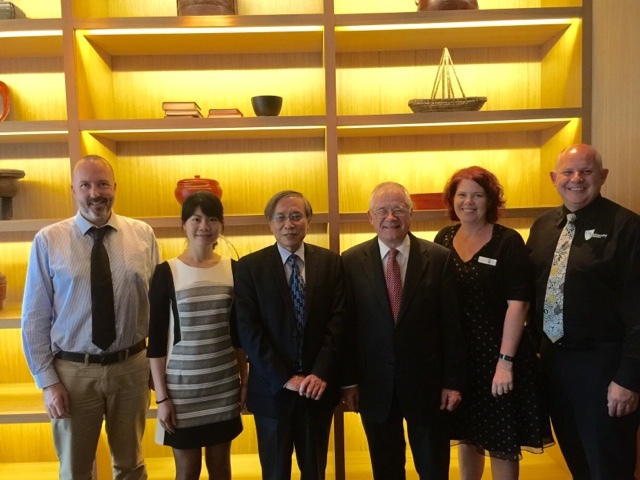 We also visited the Hong Kong College of Technology to discuss possible partnerships between our institutions. 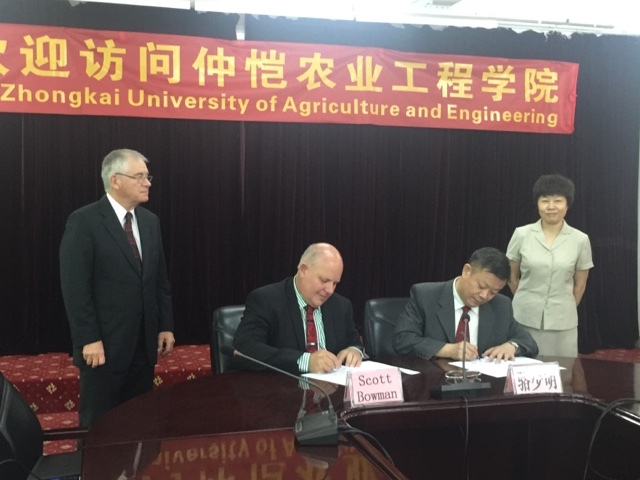 One of the highlights of the tour was signing an Memorandum of Cooperation with Zhongkai University of Agriculture and Engineering. 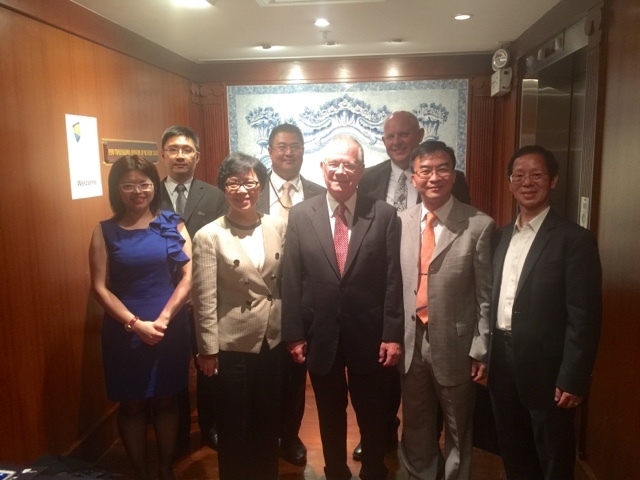 It will be great to work with President Luo Shao Ming to bring our two universities closer together in the future. We are planning exchanges and joint programs. Another highlight was travelling to Chengdu to visit South West Jiaotong University. This is one of China's leading universities and the absolute leader in railway engineering. 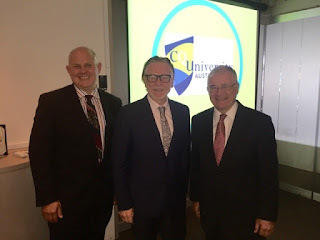 It is well known that one of CQUniversity's main research strengths is railway engineering - so the two universities could have a good partnership. It was good to meet with Vice President Xiaoyun Feng to discuss possible links. It was great meeting with alumni and hearing about their fond memories of their time at CQUniversity. We went to Mongolia to discuss VET linkages and and opportunities for CQUniversity to attract more Mongolian students. Again we also had an opportunity to meet with our alumni in the region. 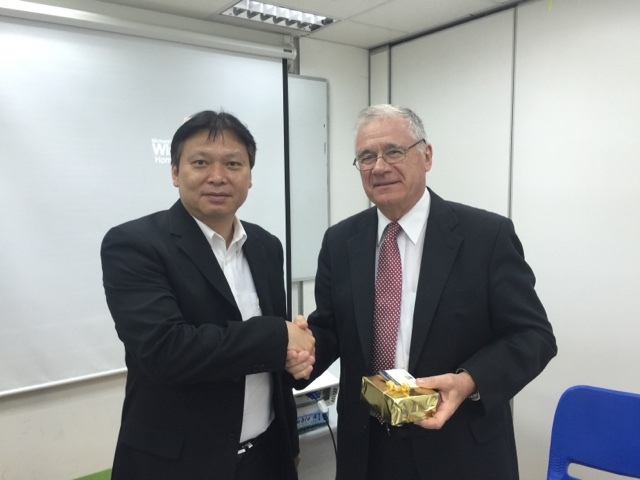 Mongolia is very important to CQUniversity. 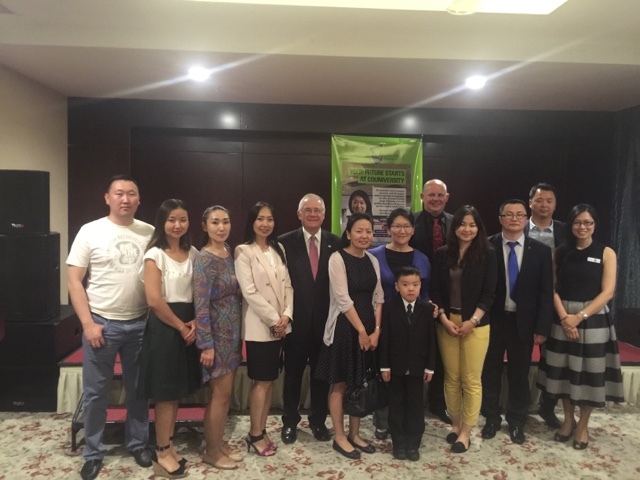 We have more Mongolian students than any other Australian University and we have many great alumni in the country. There are also many similarities between Mongolia and Central Queensland. Both are resource rich and have very large extractive industries. Both are challenged by the down turn in commodity price and both are rural with a vast land area and relatively few people. 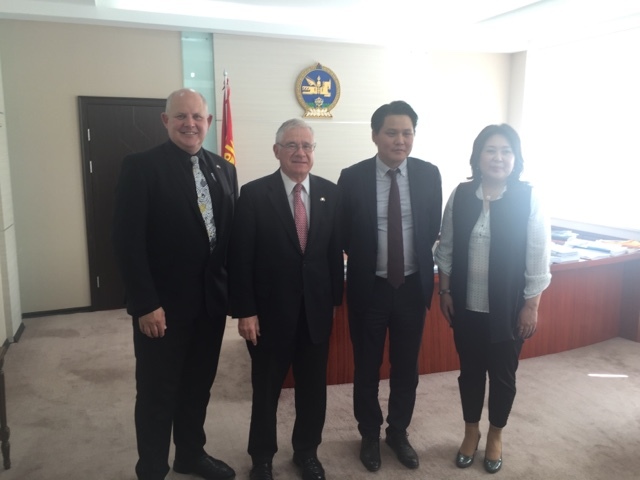 All of this makes it natural that CQUniversity and Mongolian organisations become partners. This photo is bound to take pride of place on my office wall for many years to come. This is the Chancellor and I trying out our new academic regalia. OK the weekend over and back to work. Well not for me actually. When I was in the UK I pulled a muscle in my back. It has been giving me a lot of pain over the past week. But yesterday (Monday) I could not move at all. 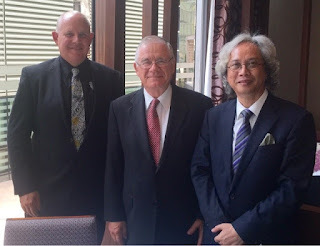 I was very sad to miss the lunch with two of our most prominent alumni in Mongolia. I was back on my feet by the evening and was very pleased to be able to attend the evening function with a much bigger group of Alumni. The lunch was a great success with the Chancellor hosting the lunch. The Alumni gave a great deal of useful feedback to the Chancellor and our staff. We noticed that all of the Alumni who we met were working in very high powered jobs and that their careers were forging ahead. It really does demonstrate the power of an Australian degree. 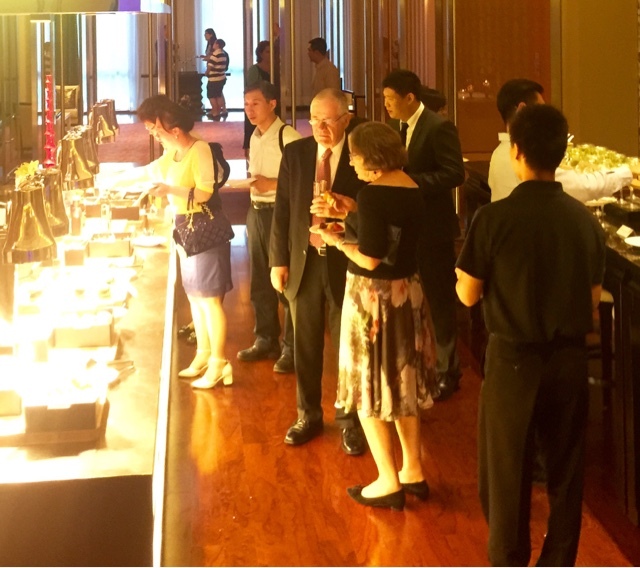 That evening we hosted the largest alumni and partner event of the whole trip. It was a great opportunity to update Alumni on what has been happening at CQuniversity. It became apparent that our university has a very high profile in Mongolia and is the lead destination for Mongolian students. 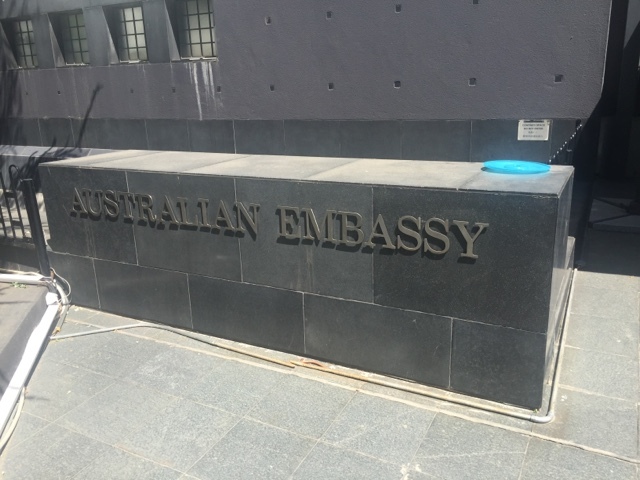 The event was also supported by Austrade who have been very helpful during the whole trip. On Tuesday we were up early for a round of meetings. First we met with Vice Minister Tulga Buya from the Ministry of Education, Culture and Science. We discussed some very exciting possibilities for progressing our engagement with Mongolia. We will be following up on these discussions over the coming weeks. It was also good to meet with Narantuya Tuya the Director of International Cooperation Division from the Ministry. 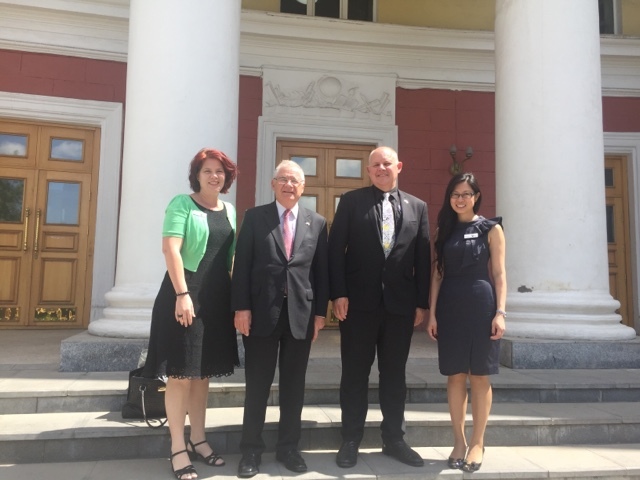 Then it was off to the National University of Mongolia to meet with Vice President for Research and International Studies Dr Bazartseren Boldgiv and Sh. Mendbayar. We discussed ways our two universities could work together including 2+2 degree arrangements. 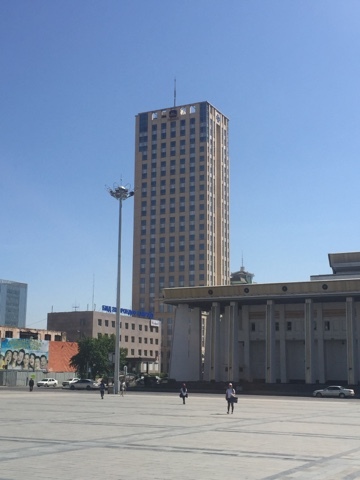 NUM is the oldest university in Mongolia. Our next meeting was at the Mongolian University of Life Sciences. The President of that University Professor Tumurbaatar Kheruuga was very generous with his time. He briefed us on the activities of the university. We discussed how we could work together in the field of agricultural research and education. There are a number of similarities between our two universities. 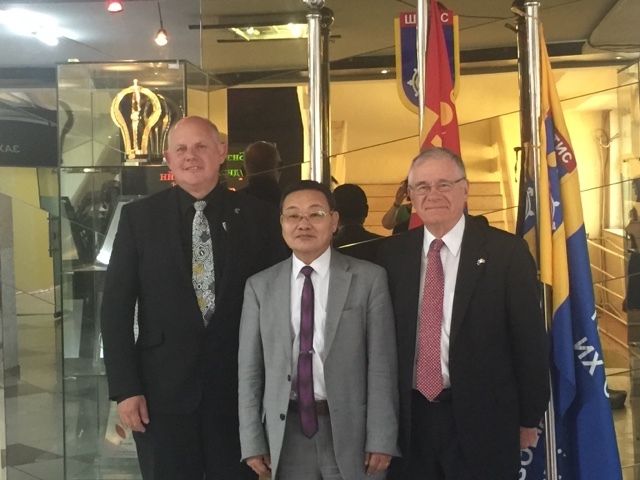 The final meeting of the whole trip was at the Mongolian University of Science and Technology MUST. Unfortunately the President of the University Baatar Ochirbat was overseas. We did however have the chance to meet with Professor Gombodorj Batkhurel the Director of the School of Business Administration and Humanities. Again we discussed cooperation between our universities. So that was the end of all the meeting and events. 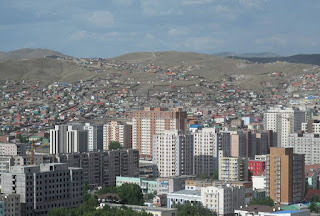 I am finishing this post on a Mongolian Airways plane flying between Ulaanbaatar and Seoul. I will post it when I arrive. It has been a fantastic trip - I am just about to write another post reflecting on the past couple of weeks. So we are now in Mongolia. It was a pleasure to have a weekend off from meetings and events. 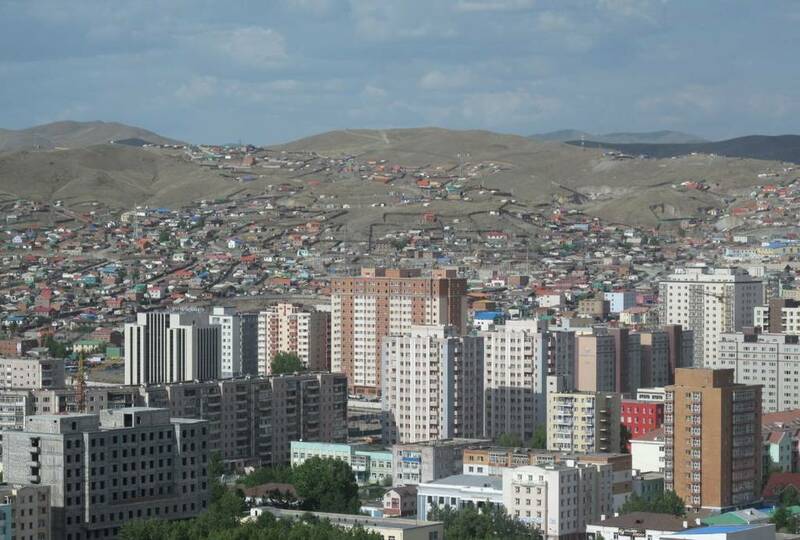 We are staying at the Best Western Hotel in Ulaanbaatar (or UB as the locals call it). We choose this hotel because the deputy manager of the hotel is one of our alumni. It really is a great hotel. 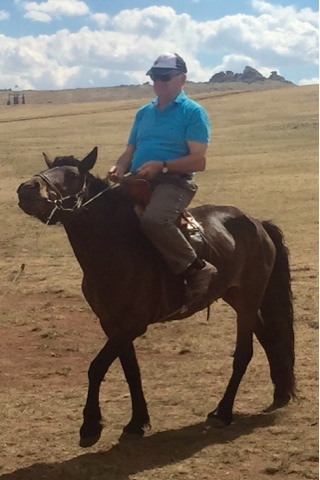 So over the weekend we managed to get out into the country side and see some of the traditional ways of Mongolian life. 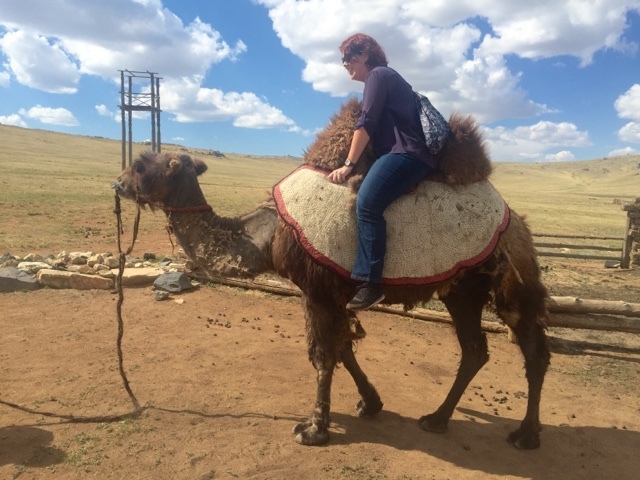 We got to eat in a Mongolian tent and some of the braver members of the party including the Chancellor rode horses and camels. For me this will always be the sound of this trip and of Mongolia. 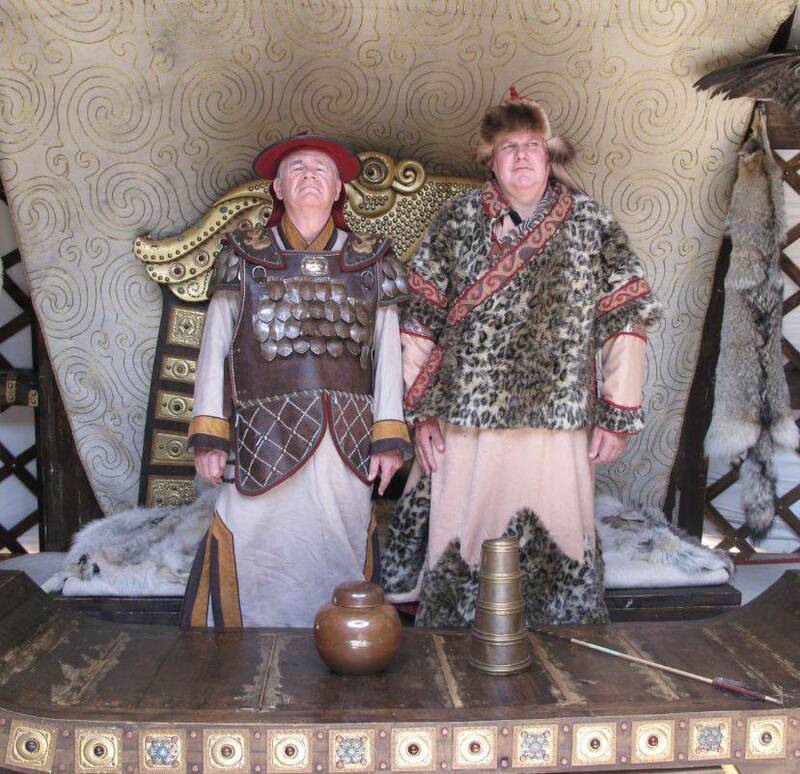 Mongolia is very important to CQUniversity. We have more Mongolian students than any other Australian University. We have many great alumni in the country. There are also many similarities between Mongolia and Central Queensland. Both are resource rich and have very large extractive industries. Both are challenged by the down turn in commodity price Both are rural with vast land area with relatively few people. 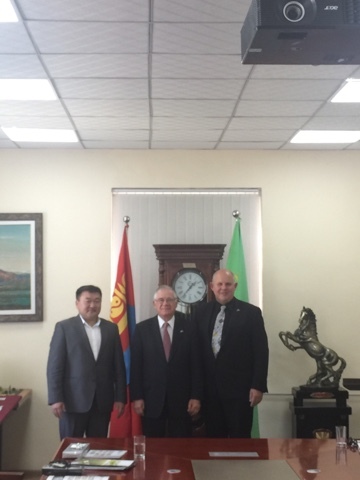 All of this makes it natural that CQUniversity and Mongolian organisations become partners. 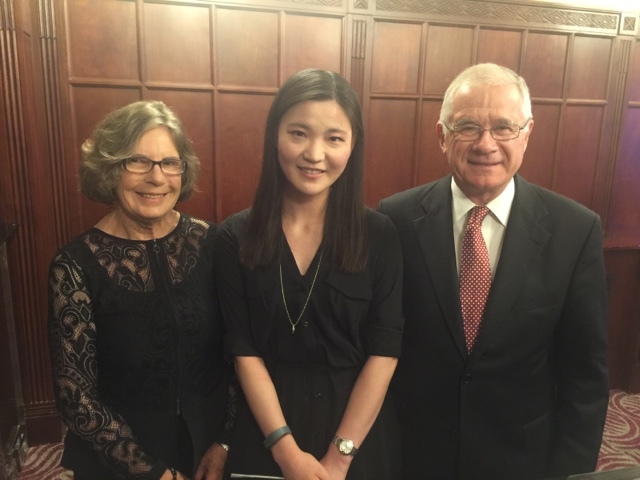 We are very lucky to have Ivy Chung working for us in the International Office. Over a number of years she has build up great relationships in the country. We are are also building on the links that the former CQ TAFE (now part of the university) had with the mining industry in Mongolia. 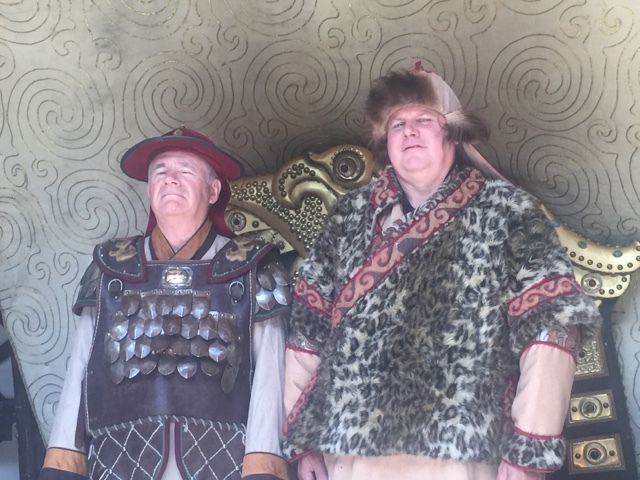 Mongolia is not what I had expected. It is a modern country with some of the warmest people on the planet. It also has a very long and proud history. I would really like to visit this country as a tourist and really get to know it. Also worth noting that the Chancellor and I got to try on some new academic gowns. 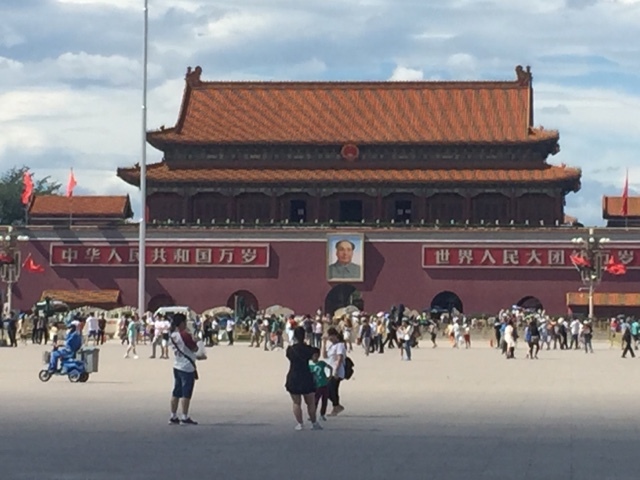 We had another short stay over in Beijing at the end of last week. 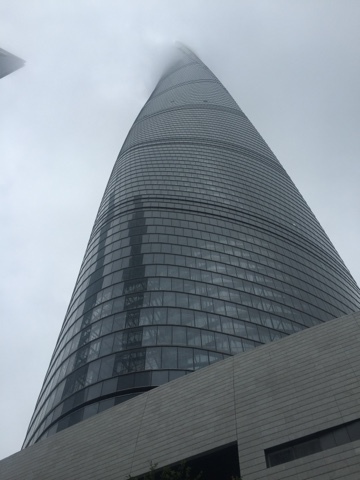 We left Shanghai early on Thursday morning and arrived mid morning. We then left late on Friday. Even though it was a whistle stop tour we managed to cram a lot in. 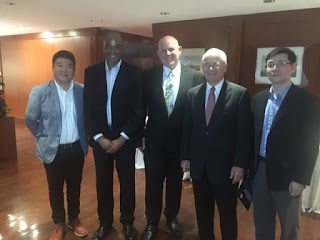 Rob MacDonald from our International Office met us in Beijing along with Frank our members of staff who is based in China and covers the Nortn of China for us. After arriving we went straight on to an alumni lunch with one of our very prominent alumni Derek Chan. Derek studied accounting at CQUniversity in Mackay. He was one of our earliest international students on that campus. He has very fond memories of his time with us. He is now a Principal at LVF Capital. He is also the Deputy President of the North China Committee of CPA Australia. He is going to work with us to identify how we can make more contact with our Alumni. 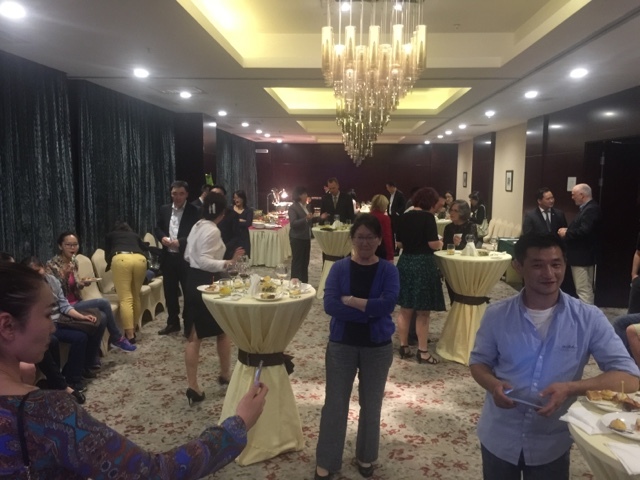 On Thursday evening we had an Alumni and Partners event. This was well attended and it was good to meet up with so many people. The feedback from our Alumni was that they want to be more involved with the University. There were lots of good ideas on how we could use their expertise - including using them to act as mentors to our students. 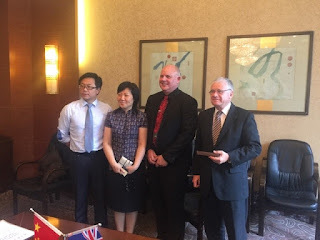 Next morning I went to the Australian Embassy to meet up with David Dukes, Liu Zhen and Chuyang Liu from the Australian Trade Commission. They gave a very informative briefing on market conditions in China. 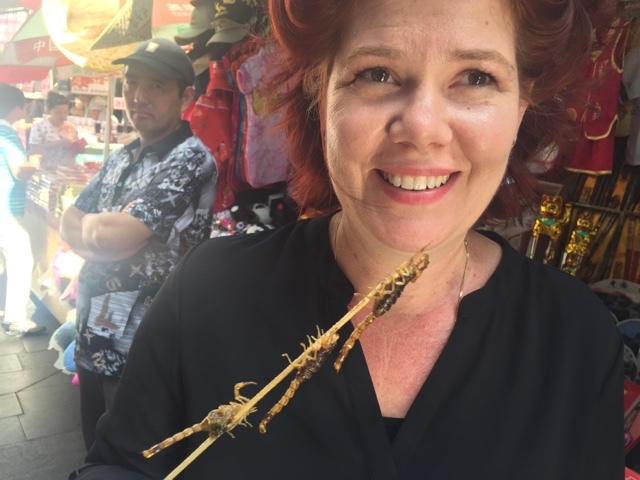 The low exchange rate of the Australian Dollar does open up some great opportunities for us. I think that in the future our in country staff will make much great use of the services provided by Austrade. In the afternoon I met up with one of our very important partners at GROK - James Aldridge. I also received a market briefing from him. I also discussed how we could work with his company to increase our reach in China. 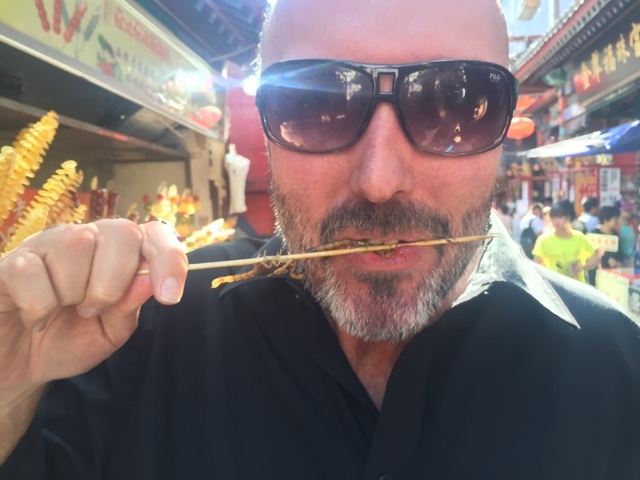 It has been a flying (literally) visit to Chengdu. We arrived less than 24 hours ago and are now waiting again at the airport to fly on to Shanghai. It really is a nice looking city and it would have been nice to have stayed longer and had a longer look around a city which is home to 15 million people. 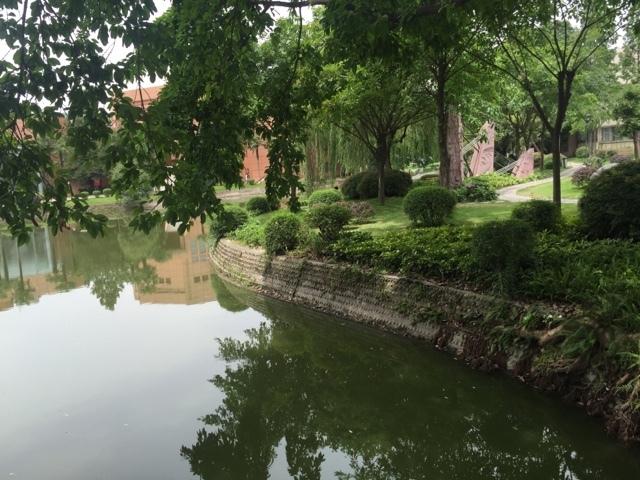 The main purpose of coming to Chengdu was to visit South West Jiaotong University. This is one of China's leading universities and "the" leader in railway engineering. It is well known that one of CQUniversity's main research strengths is railway engineering - so the two universities could have a good partnership. It was good to meet with Vice President Xiaoyun Feng to discuss possible links. Also seen in this picture is Dr Pengfei Wang the Director of their International Affairs Office. We also met with Professor Yan Kaiyin, Professor Yanjun Qiu, Professor Jianguo Jiuwen and Ruojun. We are all ver grateful for the time that they made available to us. 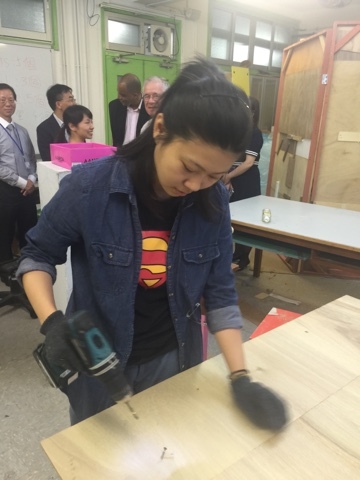 We are looking forward to hosting a visit from the President of South West Jiaotong University later in the year. 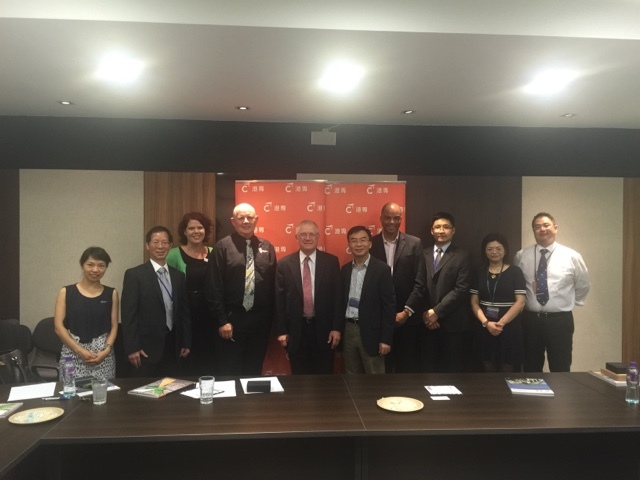 We discussed some very innovative ways in which the two universities can collaborate both in China and Australia. I am looking forward to getting back to Australia to discuss the partnership with CQUniversity staff. Now onto Shanghai and a real luxury - two nights in one bed!!! 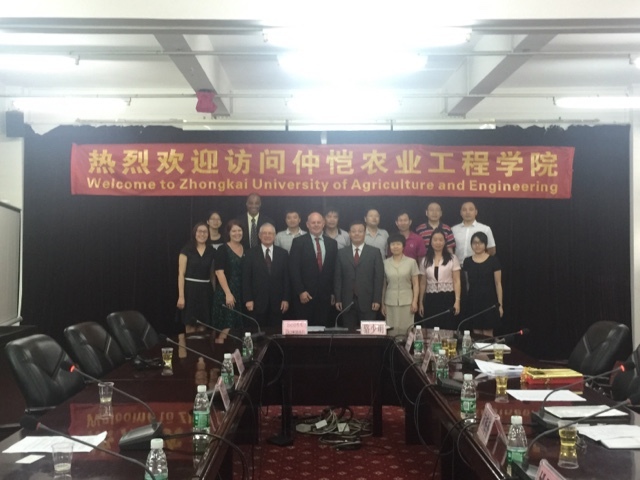 I was very pleased to sign a Memorandum of Cooperation with Zhongkai University of Agriculture and Engineering. It will be great to be working with President Luo Shao Ming to bring our two universities closer together in the future. We are planning exchanges and joint programs. A delegation form Zhongkai University will be visiting our Bundberg and Rockhampton Campuses in July. tn delegation will be led by Professor Mei Mei Xiang the Vice President of the University. 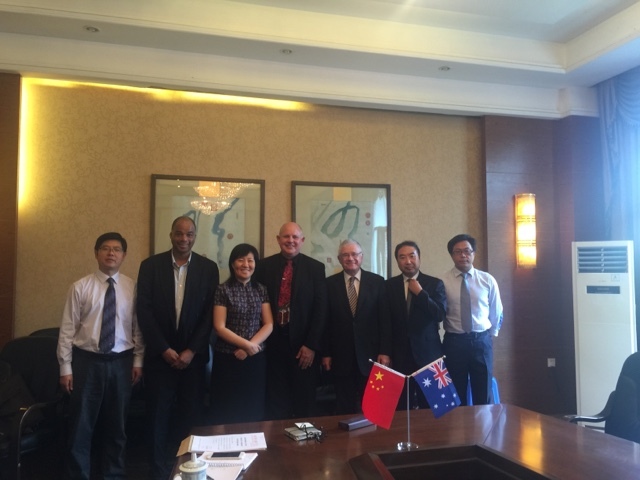 Food security will be a major issue for both China and Australia in the future so it is great that two leading agricultural universities are getting together like this. It is a great honour for me, the Chancellor and our party to be here today to sign this important MOU with Zhongkai University. The future of the planet and humanity depends on achievements that will be made in agricultural and engineering science and education. Today we come together to play our small part in bringing about these achievements. I have watched the relationship forming between our two institutions with great interest. Our two universities have many similarities. Both of us have a focus on agriculture and engineering. What could be more important than feeding and building the world. Over the coming decades food security will be a major issue for China, and in fact the whole of the world. Agricultural Scientists in the past have always achieved what seemed like the impossible. Take for example the production of wheat. Since 1945 wheat production in China has gone from 1 to 5 tonnes per hectare. This is due to producing new varieties of wheat and better use of fertiliser. To feed our population in the future similar improvements will have to be made and these improvements will originate in our universities. Let us be clear advances in agriculture have the potential to save more lives than any other discipline including health care. Take for example the work of nobel laureate Norman Borlaug. It can be argued that this agricultural scientist has had a greater positive impact on humanity than any other human being. He has become known as "The Man who saved a billion lives". 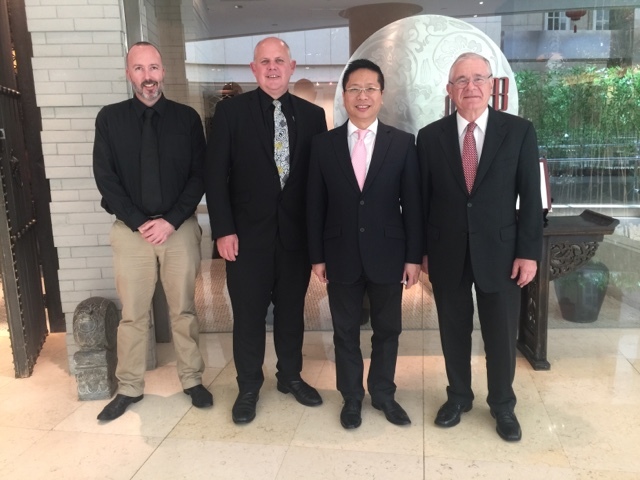 Central Queensland University is the leading agricultural university in Queensland and is already working with Chinese scientists in areas such as dry land rice production. I am confident that bringing our two universities together will have massive benefits to the communities we serve in the important area of food production. we do not only have to feed the world but also build the world. As our countries develop we need improved road networks, communication systems, and housing. This improved infrastructure can only be achieved by having top class engineering research and education. Our two universities have a focus on engineering and by coming together there will be a synergistic effect and our combined efforts will be much greater than us working apart. At CQUniversity we are well known in Australia for our railway and power engineering. I look forward to working with Zhongkai University to promote these two areas of academic endeavour. This partnership will build on the already strong relationship between Guangdong province and Queensland which is cemented in a cordial sister province/state relationship. So today we begin a relationship which will be of great benefit to our two universities. But to be honest, what is more important is the benefit that this relationship will have on the communities we serve. The relationship will be judged on the improvements that we can make to the sustainability and living standards of our communities and people in both China and Australia. 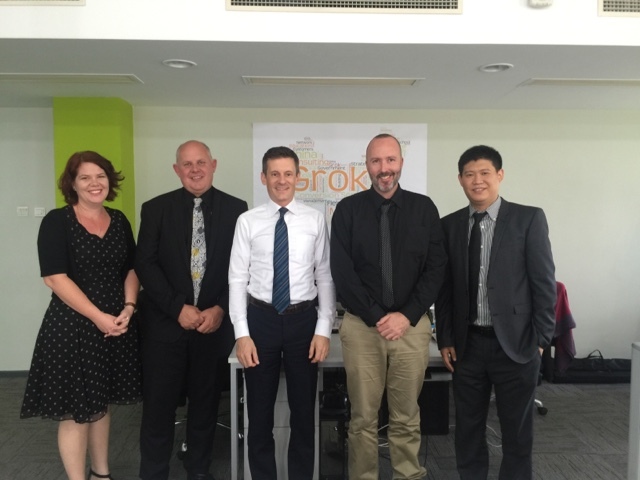 I am looking forward to reciprocating your warm hospitality when you visit our campuses in Bundaberg and Rockhampton next month and in particular I am keen to show Vice President Xiang around our facilities. I wish this relationship, our two universities, and our two countries great prosperity in the future. Thank you. A very short stop in Guanzhou - less than 24 hours now off to catch a plane to Chengdu. A good start to our second day in Hong Kong. The air is still very clear and a blue sky. Much better than I have seen in Hong Kong for the past 20 years. 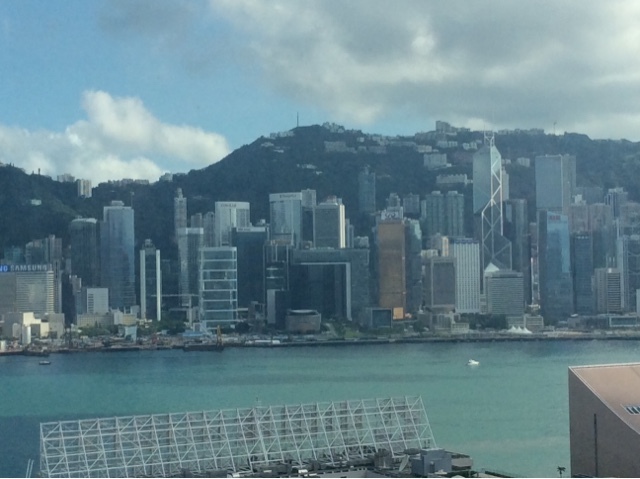 Many years ago I used to do teaching visits to Hong Kong for South Bank University in London. I spent a lot of time at Hong Kong Polytechnic University. Dr Woo is an Honorary Citizen of Guangzhou City of Mainland China and the City of Houston, United States. These awards were bestowed for advancing international relationships. CQUnivers is proud to have such Alumni of the University. We then visited Hong Kong College of Technology. As well as meeting with staff to discuss possible partnerships it also gave us a chance to meet with some design students studying at the College. Quite a long day - but a good one. An early start to the day to catch our flight to Hong Kong from Singapore. 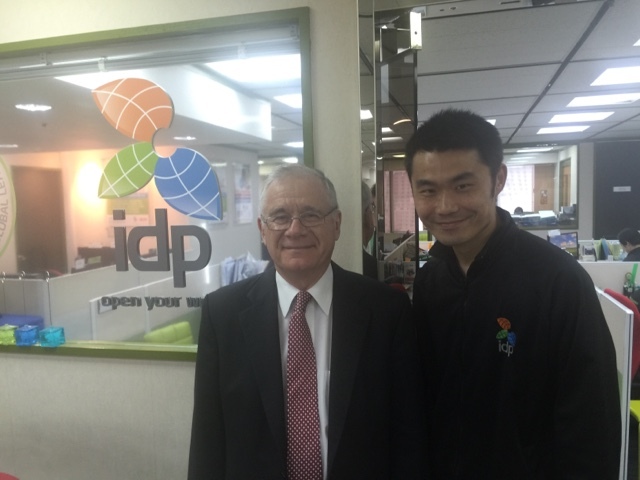 It was good to be met at the airport by Giles our staff member based in China. Also good to get a briefing from him about this part of the world. After the 4 hour flight we had a couple of hours before leaving for our partners and alumni event over on Hong Kong Island. 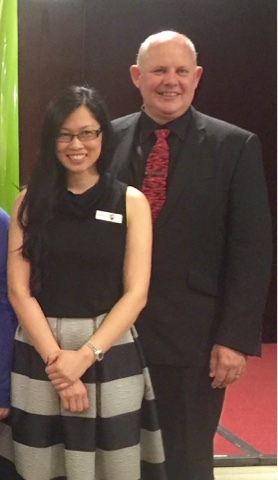 At the event it was good to meet up with Angela To the Queensland Commisioner for Trade and Industry in Hong Kong. She has a wealth of knowledge about the region. We were very grateful to Dr David Sze and Dr Gavin Chau who came over from Macau for the event. They were from the City University of Macau and are keen to partner with us in the management area. As always the highlight of the evening was meeting with our Alumni and hearing about the great things they had done since getting their degrees. The Chancellor and I are getting into a routine with our presentations. I think our team are going to get very fed up with hearing me go on about the university for the next couple of weeks! 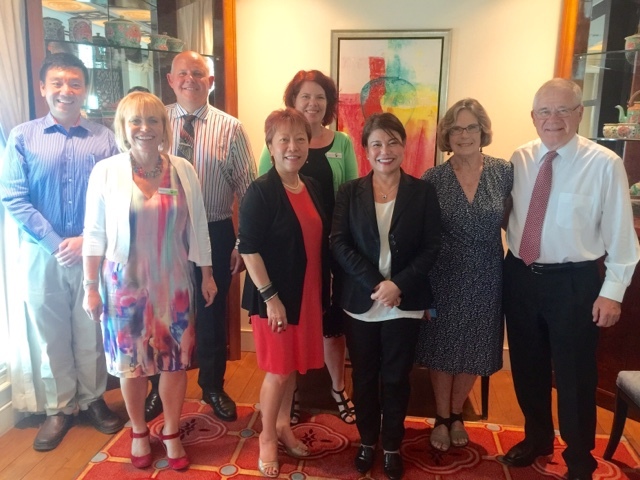 So here we are in Singapore at the start of a busy couple of weeks in Asia to promote CQUniversity. Over the next two weeks the Chancellor and I will be meeting with many alumni of the university and with our partners across the region including many universities and colleges. We start in Singapore today then tomorrow go to Hong Kong from there it is on to China and Mongolia. I am going to blog regularly so that the university can see what we are up to and maybe identify opportunities to build relationships with this very important region. With a population of 5.5 million, Education in Singapore is the second largest investment and key services export after Defence. In recent years, Singapore has moved towards a more flexible and diverse education system, aimed at providing students with greater flexibility including dual delivery program models (in country and internationally) and expansion of distance education programs. A shortage of public university places in Singapore is the key reason 21,700 Singapore students pursued their studies overseas. The unmet demand presented opportunities for many study destinations including non-traditional study destinations such as China and Europe to attract more Singapore students. Australia remains the preferred study destination for Singaporean students followed by the UK, and USA. So today we had lunch with three of our important alumni members Dr Carol Balhetchet Director of Youth Services - Singapore Children's Society, Dr KC Chang Managing Director for Planning and Logistics (Asia Pacific) Fed Ex Express and Dr Lina Director of Nursing - Lions Home for Elders. Each of these very impressive people have doctorates from our university. We are looking how we can better serve them as past students. This evening the Chancellor held a Reception for Alumni and University Partners. This even was a great success and we were able to connect with many friends of the University. The Australian High Commissioner to Australia Mr Philip Green attended the event. It was good to hear a briefing from him about Singapore and share our plans for Singapore. The Chancellor spoke about CQuniversity's engagement agenda and I gave a presentation on how we were developing as a university. It was good to have Anita (my wife and Program Director for Ultrasound, Chiro, Medical Imaging and Echo Cardiology) to give information about out health programs. It has been a very quick visit to Singapore - but very worthwhile and one that we can build on as a University. Off to Hong Kong first thing in the morning.